Amitabha, also known as Amida or Amitayus, is a celestial Buddha portrayed in the scriptures of Mahayana Buddhism. Amitabha is also the preeminent Buddha in Pure Land Buddhism, a part of East Asian Buddhism. In Vajrayana Buddhism tradition, Amida is known for his longevity attribute, the aggregate of discernment, magnetizing red fire element, the deep awareness of emptiness of phenomena and pure perception. According to these sacred scriptures, Buddha Amitabha possesses infinite merits resulting from good deeds over many past lives as a Bodhisattva named Dharmakara or Hozo Bosatsu. 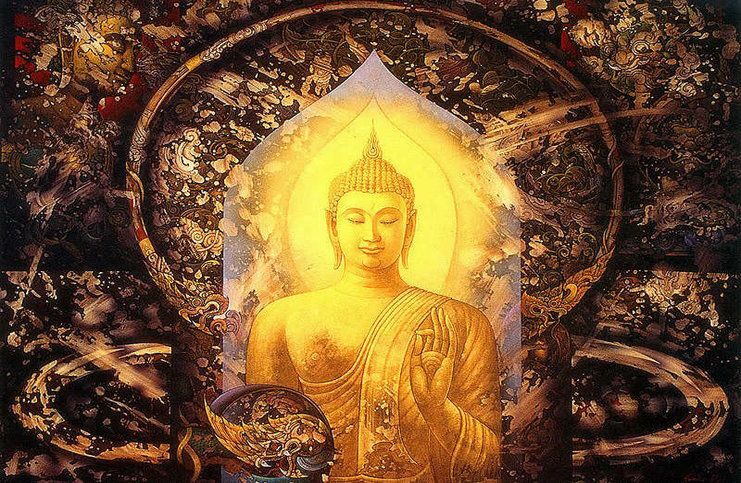 „Amitabha” translates as „Infinite Light,” thus Amitabha is also called „The Buddha of Immeasurable Life and Light”. He is also well known in Mongolia, Tibet, Bhutan and other regions where Tibetan Buddhism is practiced. In the Highest Yoga Tantra class of the Tibetan Vajrayana Buddha Amida is viewed one of the Five Dhyani Buddhas (together with Ratnasambhava, Aksobhya, Amoghasiddhi, and Vairocana), who is associated with the skandha of saṃjna and the western direction, the aggregate of recognition (distinguishing) and the deep awareness of individualities. His consort is Paṇḍaravasini. His 2 main disciples (the same number as Shakyamuni Buddha) are the Bodhisattva Avalokitesvara and Bodhisattva Vajrapani, the former to his right and the latter to his left. In Tibetan Buddhism, there exist a number of famous mantras for taking rebirth in Dewachen (Sukhavati). One of these was written by Je Tsongkhapa (from Gelug school) on the request of Manjushri. He is frequently illustrated as a bhikshu (a Buddhist monk), when He is depicted seated, with His hands in the dhyana mudra (hand gesture which improves the ability to concentrate during meditation). Moreover, when He is depicted standing, He is represented with the right hand facing outward also with thumb and forefinger touching, with left arm bare and extended downward with thumb and forefinger touching. Gautama Buddha Shakyamuni said that this Dharani (long mantra), if recited even only once, purifies the veils of negative karma accumulated for 100,000 kalpas. Furthermore, the mantra has boundless benefits. Buddha Amitabha can bring us all the beneficial qualities and characteristics, but it is especially important to be focused upon him at the moment of death (physical body). 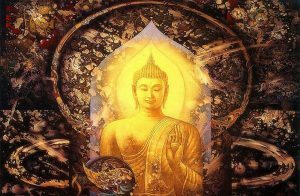 And to prepare ourselves for a death we use to meditate upon Buddha Amida and repeat his soothing mantra. More importantly, when practicing this mantra with sincere intentions, Buddha will eliminate the heavy guilt ever since beginningless and we will get wisdom and blessedness of endlessness. In Tibetan Buddhism, we commonly visualize Buddha Amitabha in a dark red ruby color above our head, above Sahasrara (crown) chakra. He is radiating everywhere around him a bright healing ruby-color energy field. The most important part when reciting a mantra is your present vitality. Do not practice mantra meditation when you cannot concentrate, have a weak will, have too much thought in mind, or you are in a gloomy mood, because these factors will have a powerful negative impact on your practice. This entry was posted in Buddhist Mantras on February 1, 2016 by admin.